I’m on my way to New York! Like, as we speak. I’m tip-tap-typing to you on an airplane, from seat 10D (which is in an exit row! Holler extra legroom), many thousands of feet above ground. Three cheers for you, Technology! I’m making the trip back east from Seattle to do a few last-minute wedding things, (including dress fitting, eeeek! ), and I get to catch up with some family and friends, to boot. And assuming that pesky little dress fitting doesn’t get in the way, I anticipate enjoying a bagel (from Russ & Daughters), a slice of pizza (from pretty much anywhere), and a doughnut (from Dough) during my visit. Or maybe a paleta from La Newyorkina on the High Line. Or some Big Gay Ice Cream. Ooh! The chicken at Barbuto. I want that. Or! A Momofuku pork bun and cornflake cookie? Yes, definitely that. …Shoot. I’m going to need more time. I always love visiting New York City. Having lived in the city for three years (during and after culinary school), I know my way around and, now that I no longer live here, find things I once found irksome (the crowds, the smell, the rush, the buskers, the Subway, etc.) to be positively charming. Yes I WILL throw some money your way, person rapping on the F train! OF COURSE I will walk behind you at a glacial pace, clueless tourist! Since I don’t actually live here anymore and don’t have to deal with these issues on a regular basis, I can chuckle at the rat scurrying near that pile of garbage bags, or roll my eyes indulgently at the guy taking up a whole row of seats on the (crowded) A train. I really do heart NY. I realize that none of this has anything to do with tuna salad. Except for the obvious connection between The Big Apple and (The Big) Apple Dill Tuna Salad. So basically they have everything to do with each other, is what I’m saying. Are you a tuna salad person? I love tuna melts. I go open face, usually with a mess of sharp cheddar. 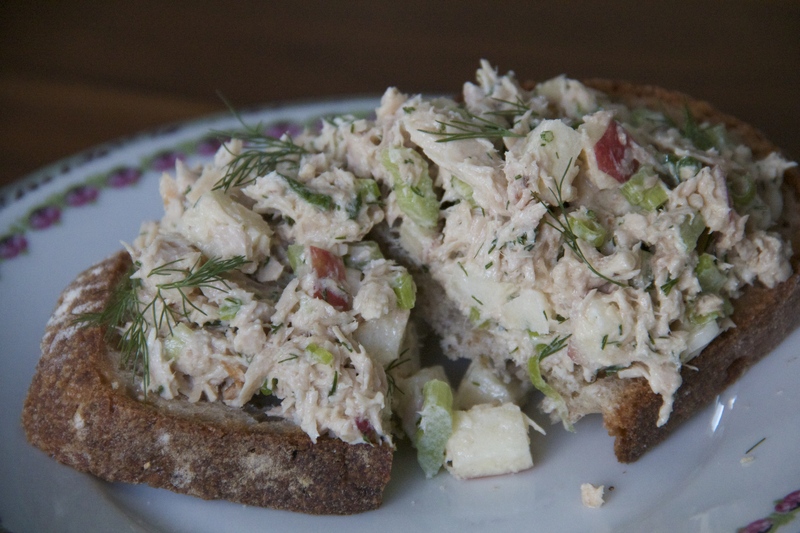 This tuna salad with apple and dill is excellent in that capacity. It’s a little herby, with just enough sweetness and tang. It makes a great lunch or quick dinner, when you don’t feel like doing all that much, effort-wise, in the way of lunch or dinner. I wish I had brought some on the airplane with me, but I didn’t because I like to think that I’m a considerate human. A considerate human, on her way to New York! See you soon, Big Apple. 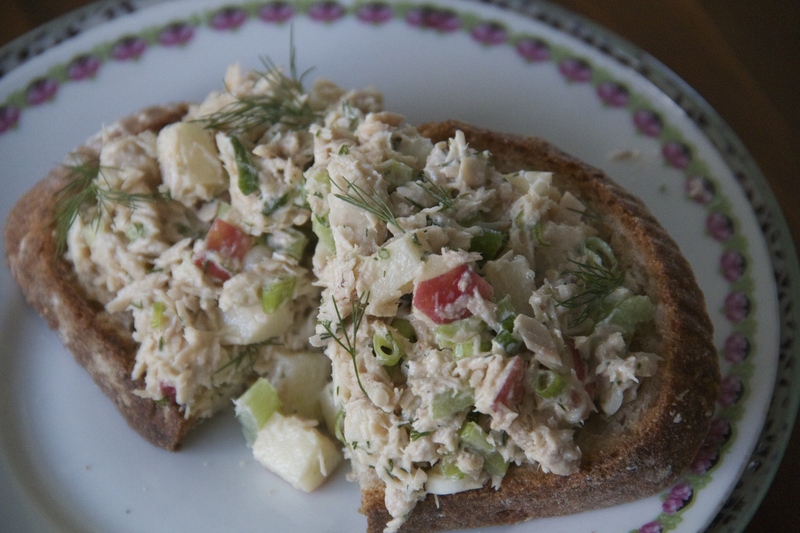 In a medium bowl, combine the tuna, celery, apple and scallions. In a smaller bowl, whisk together the mayonnaise, Dijon, olive (or pickle) juice, dill, and a pinch each of salt and pepper. Pour the dressing over the tuna, and mix well to combine. Taste and adjust the seasoning to your liking. Makes about 3 cups. 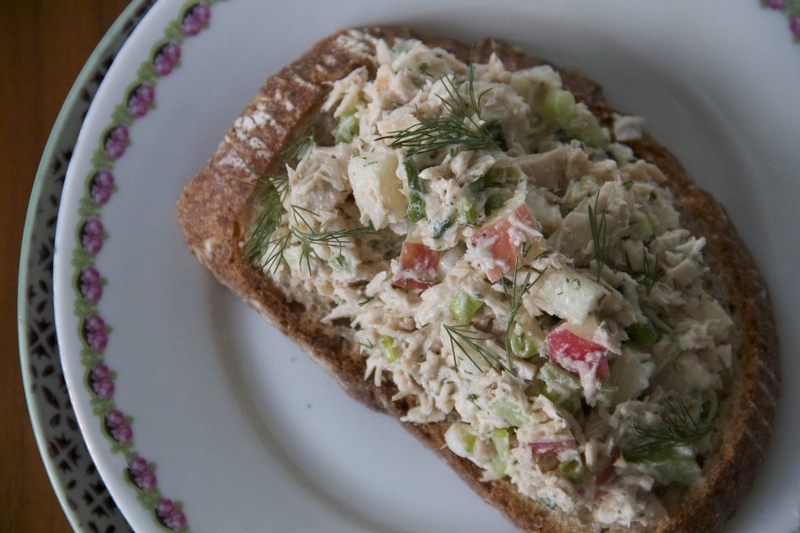 Tuna salad will last, in an air-tight container, for 3-4 days in the refrigerator. This looks like a perfect choice for lunch for the whole staff here at BRG Enterprises today! Great idea! Thanks! And, as it turns out, some of us will be in NYC this weekend. We’ll look for you! this looks amazing, chef molly! sure wish i could see you this weekend and have some of this wonderfulness! did i tell you i pre-ordered SEVERAL cookbooks? might ask you to sign them, k?